When you worship someone, is it because you wish you could be that person? That was the third trip downstairs for food. I wasn’t hungry; I was angry, mostly with myself but not ready to admit it. I’d eaten a huge lunch at the Grove so this was just old learned behavior that was supposed to make me feel better. Using food for comfort. Only I felt worse. A handful of chocolate chips, a grapefruit, nuts, and a piece of cheese did not serve to comfort me. I’d promised myself hundreds of times that I would break my self-destructive snacking habit and I was always going to start tomorrow. But some days were worse than others and this was one of the bad ones. It started innocently enough. And with good intentions. As a devout 65-year-old groupie of a 65-year-old rock goddess, I’d followed Stevie Nicks and Fleetwood Mac all over the country, and occasionally the world, but I’d never really gotten close to Stevie. We were in the car on the way to Barnes and Noble so I could get Stevie Nicks’ autograph on her new DVD. I’d met Mick Fleetwood and chatted with him and Waddy Wachtel, her guitarist, but never with Stevie. Maybe that’s part of the allure, getting close to someone who works hard to maintain her image and not let you know the real “her” by remaining elusive. Someone who casts a spell and then works hard at maintaining the illusion. I’d spent most of childhood trying to get to know my parents who held so much back that I had had good training in being patient. But today was devoted to getting to B&N by 9am to get a wristband that would allow me to return at 7pm to wait in line yet again to spend about 10 seconds in the presence of a goddess I’ve worshipped for at least half of our respective lifetimes. “I can’t believe you,” I said angrily to my husband Steve as he made yet another U turn. “You’ve driven to the Grove thousands of times and you pick today to screw it up.” “It’s not my fault,” he said. “And anyway I told you we should leave earlier but you didn’t want to get up.” It was true that I wasn’t one of those groupies willing to stand outside of B&N overnight, but I thought if we got there before 9am we’d be fine, but because he picked up his phone to check his texts while driving, a behavior that made me nuts in the best of times, he missed the exit to La Cienega and had to circle back through the morning rush hour traffic. I felt a sense of what can only be described as relief: Now if I didn’t get up close to Stevie I could blame my husband. How can you want something and not want it at the same time? By the time we arrived the line was already around the block and it wasn’t quite 9am. Steve offered to drop me off before he parked but I said no, he was nice enough to drive me, I’d go park with him. How long could it take? Then the queen of self-sabotage rushed her husband out of the parked car and onto that long line. We chatted with some other admirers of Stevie, surprised at how many young people were in line for a “senior” rock goddess. The line snaked slowly forward. We got to the front of the slow moving line. You had to purchase a CD or DVD to get the wristband, a sacrifice I was willing to make although I already owned both. After the purchase we were told that they had already handed out all the wristbands they were going to, and that we were now “on standby.” Standby meant you could come back at 7pm, show your receipt, and stand in line again, and maybe, but not likely, get to see Stevie. One salesperson said, “Well, it depends on how long she wants to stay.” I did the math. Four hundred people in three hours, or even four hours that now meant 11pm. Without a break, that would mean Stevie would spend less than 30 seconds per person signing their CD or DVD. I could sense he was really getting annoyed with me and he had been so kind and patient all this time with my “obsession” that I didn’t want to badger him any more. It wasn’t his responsibility to make my fantasy come true and he had been nice enough to repeatedly approach his friend on my behalf. We rode the rest of the way home in silence. I started to think about how strange this whole thing was. As child, I never had a hero or sports idol or fell for the Beatles the way so many of my friends did. I was too busy drowning in the reality of my family’s broken promises and deferred dreams. And here I am, a grown woman and I can’t even decide if I really want to meet my idol. 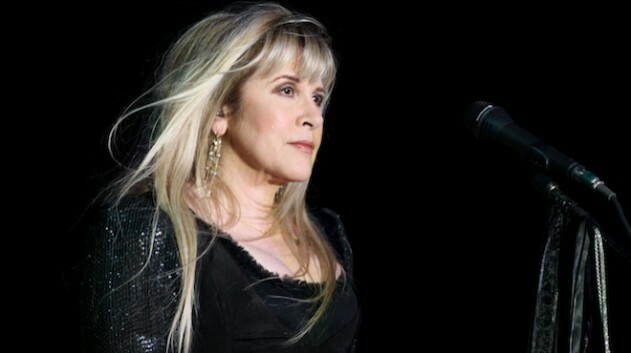 Am I afraid that a five-second conversation with Stevie Nicks will destroy my illusions about what a superstar 65-year-old woman can do or be? Do I not want to see that up close she too has wrinkles and signs of her own hard living? I know better than to think hers was an untroubled and confident life. Her life is complicated and she’s just another flawed, albeit rich, struggling human being like the rest of us. Who never had the joy of marriage and children. Who, as a legend and icon, can’t even walk on the street without being accosted. When you worship someone, is it because you wish you could be that person? What is the allure? And why do I say I really want to meet her and pull away when the opportunity presents itself? What am I going to do if Steve’s friend pulls this off? He’s nice enough to drag to Vegas with me after already having seen this same concert twice in LA. Is it just that Stevie Nicks represents something in my head that allows me to recreate in my grown-up self the disappointment that was inevitable in my childhood? I was struggling with all of this when we arrived home. Do I want to meet her or don’t I? I will owe it to a number of people to go through with it if the opportunity arises in Vegas. Will it make me happy? Am I allowed to be happy? And what happens if my bubble bursts and my idol, as Francis Bacon says, is just a mental illusion or false image? I threw myself on the bed, as Steve hightailed it down to his office. He’d had enough of my obsessive insanity for one day. I wondered what I was going to do if I really could meet Stevie Nicks in Las Vegas. I went back downstairs and grabbed a handful of chocolate chips. I wasn’t hungry. I was trying to fill myself up with something. If I could only figure out what I really wanted. After the chips, I headed downstairs again. This time I had a grapefruit. And then I ate the nuts and cheese. I was eating, but I was longing for something else. I put on a Stevie Nicks CD and tried to find a simple answer to my most complex behaviors in the lyrics of a song. And I promised myself that starting tomorrow I’d stop all the mindless snacking.